Gosh, it seems like ages ago that I was in the deep south of Patagonia. I looked up my itinerary to check the dates and discovered that it was only four days ago that I left Punta Arenas for Puerto Montt – it’s getting increasingly difficult to keep track of the days! Puerto Montt is about halfway between Punta Arenas and Santiago, and is the gateway to the Lake District, a beautiful region of crystal-clear, emerald lakes and magnificent snow-capped volcanos. I arrived there in the morning, then took a taxi to Puerto Varas, about 20 km north of Puerto Montt. The countryside here is significantly different from the steppe-like south; it’s hilly and very green, with some beautiful forests. Some of the hills were completely blanketed in Scottish broom that were in full bloom, giving entire hillsides a bright yellow cover. Puerto Varas is a quaint town right on the shores of Lake Llanquehue (pronounced as ‘jean [as in French]-kway-way’) and looks across to the stunning Mt. Osorno, a Mt. Fuji-like volcano, on the far side of the lake. The town was founded by German immigrants and that’s pretty evident in the architecture and the numerous German names all over town. It was a pretty cloudy day with occasional showers – guess I’ve run out of ‘good weather’ luck. Bit of a shame as I couldn’t see the volcanos, just a bit past the snowline while the peaks were completely shrouded in thick clouds. Puerto Varas is a resort town with many hotels (built almost exclusively in Swiss/German alpine style) that offer gorgeous views of the lake. That evening, I went for dinner at a lovely restaurant called Living. I had a beautiful view of the lake while I enjoyed the salmon and leg of lamb and a bottle of Montes Alpha Merlot. This estate churns out some exquisite reds – I’ve tried the Merlot, Cabernet Sauvignon and Camenere and they’re all absolutely divine. If you see this label in your local wine shop, don’t hesitate! The Puerto Montt/Puerto Varas to Bariloche lake crossing tour started early the next day. This is a very popular tour in this region. It starts in Puerto Montt/Puerto Varas and takes you through the Andes by a combination of boat and bus and ends in Bariloche, Argentina. I chose the version that stops for the night in Peulla, a hamlet in the heart of the Andes. We left Puerto Varas by coach and headed east to Petrohue. We managed to catch a glimpse of the conical peak of Mt. Osorno as the clouds lifted for, literally, a few minutes. I showed others the photos I took from the plane when I flew from Santiago to Punta Arenas on that clear day to give them an idea of what it looks like on a cloudless day! Along the way, we stopped at the Petrohue waterfall at the foot of Mt. Osorno. The falls were rather impressive and the colour, a deep emerald, was stunning. A lot of the rivers and lakes in this region have that same colour (in varying degrees) as the water originates from the glaciers which carry heaps of minerals with them from the mountains. The minerals, especially copper, give the water this beautiful colour. From Petrohue, we boarded a boat which took us on a two-hour trip through the beautiful Lago Todos Los Santos (All Saints Lake). It would have been an awesome boat ride had it not been for the poor weather. The lake should’ve been a bright emerald, instead it was grey, and the surrounding mountains were all hidden behind clouds. The guide showed us pictures instead (!) of the lake and the four massive volcanos that rise steeply from its shores. Oh well! We arrived in Peulla just in time for lunch. Peulla is nothing more than two hotels, a few houses and a pier! Its location though is just spectacular, with the reed-filled lake, beautiful rivers and waterfalls, and the imposing snow-capped mountains right at its doorstep. I guess being out here, right in the middle of the Andes mountains, made us feel adventurous so we decided to go zip-lining through the forest canopy. I’m usually fearful of great heights so I was quite hesitant but I went along and did it anyway. I was joined by an American couple and the guide strapped us up with safety lines, hooks, helmets, gloves and the trolley. The first was easy enough. The second was quite scary as the distance between the two platforms was about 80 meters and there was a considerable descent, which meant a greater speed. I was close to trembling and I told myself to relax, assured myself that it was totally safe. The guide gave me the signal to go and I lifted my feet off the platform and away I went. Strangely enough, it wasn’t panic that swept over me, it was pure exhilaration. This is fantastic, I thought. I didn’t brake so I zipped down at a tremendous speed, only slowing down when I neared the platform. Loved it! We went from platform to platform eight times and it was awesome! Funny how fear has us in its grip in so many ways but when we let it go for just a bit and explore that unknown, we then realise how silly we were to harbour that particular fear in the first place. The next day, we hopped onto a bus and continued on our lake crossing tour. We left Peulla behind us and continued deeper into the Andes mountains. The scenery was spectacular. Mountain peaks shrouded in mist. We passed this friendly fella along the way. Drive through thick temperate forests. We drove past the dense temperate rainforest (only one of two places on Earth with temperate rainforests; here and in Washington state) – loved the huge beech and sequioa-like trees – and past various waterfalls and gushing rivers. The Chile-Argentina border was at the top of the mountain pass and the Brazilians clambered out of the bus and were thrilled with the patches of snow. 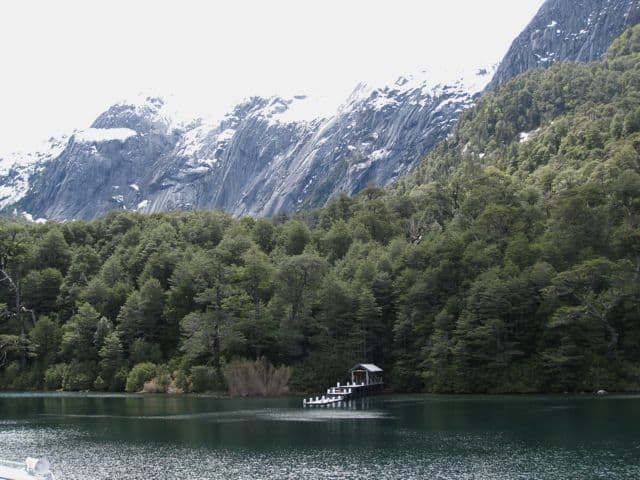 We arrived at Lago Frias (another stunning lake) and from here, we took a boat to Puerto Alegre. The weather on this side of the Andes was a lot better and we could start to see the true colour of the lake and the imposing mountains around us. We then continued by boat to Puerto Panuelo, stopping at some impressive waterfalls along the way. The boat ride to Puerto Panuelo along the Lago Nahuel Huapi offered us a magnificent vista of the huge forest-clad mountains. We arrived in Puerto Panuelo an hour later and a bus was there to take us on the last 25 km to Bariloche. A little pier in an emerald lake. Snow-capped peaks towering above Lago Nahuel Huapi. 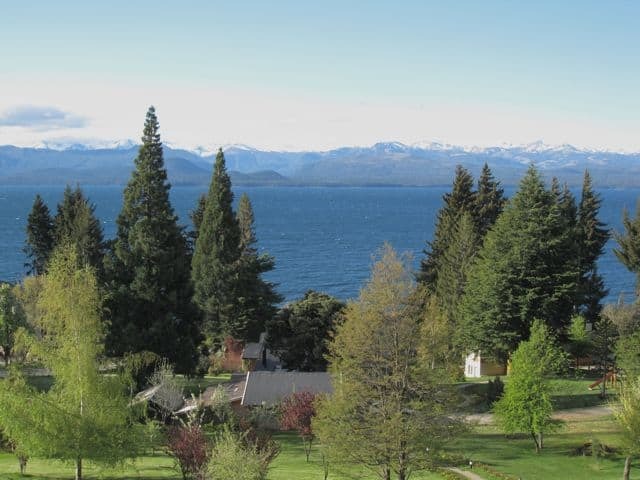 Book this Puerto Varas to Bariloche lake crossing tour. Bariloche is a popular ski resort in the winter. 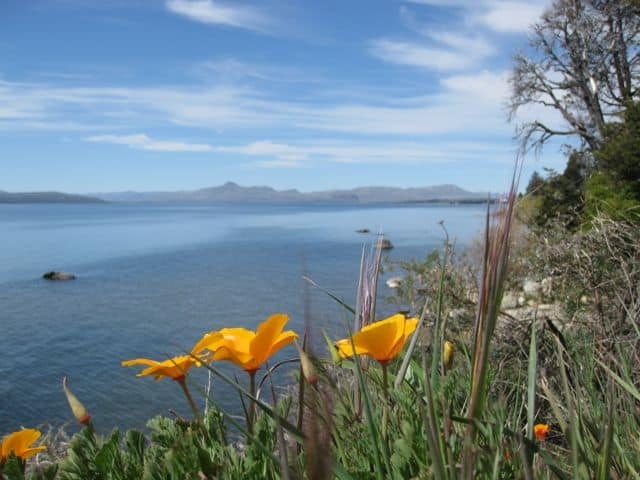 Its location, on the shores of Lago Nahuel Huapi and backed by the Andes mountains, is just breathtaking. The town itself is a bit of a jumble, kitschy in places; there are lots of restaurants, shops and hotels. In addition to the spectacular views, Bariloche is famous for its alpine architecture and chocolates – there’s a thriving chocolate industry here. I had some but wasn’t too impressed. Guess you wouldn’t be if you lived next door to Belgium, in my book, the true chocolate country! Read about my great laundry adventure in Bariloche. I booked via VisitChile.com but there are other operators that provide this tour as well. Can you tell me with what tour company did you book? I did this trip in 2008 and at the time I paid USD 240 for a 2-day/1 night trip, including accommodation in Peulla. I imagine the prices are higher now. what was the cost of this trip? What a trip down memory lane! My husband, 2 kids & I took this trip back in 1989. We loved it! Unfortunately, our photos and videos were stolen on the way home so we have only our memories but they are wonderful. Thanks for sharing! Haha, not sure but it’s pretty long. The other Travel Journal post ‘A Desert Full of Wonders‘ is pretty long too! wowee.. this has got to be your longest post ever.. is it? it’s really excellent, what you experienced. I think I will be totally stupefied by the beauty of the Andes once I see it up close and personal.. hope that day is not in the too distant future! What an amazing adventure, your writing and pictures bring it all to life!